Just to clear the air: that hideous, cringeworthy, full-body-shudder inducing bike parked in front of my favorite coffee shop deserves an explanation. But because this is Part 1 of DIYBIKING.COM’s #GiftsforCyclists special, you’ll have to wait. Since the hashtag is self explanatory and one that isn't getting a lot of use on Twitter at the moment, I’ll just go right out and say that if you are buying presents for any cyclist this year check DIYBIKING.COM every day until Christmas - and follow my suggestions to relieve your holiday stress. Let’s start here: Cyclists have a very special relationship with coffee. I’ve documented this several times and, as a service to readers, biked around Stamford on what eventually became The Bikeducken to see what coffee cup lids would splash the rider the least. 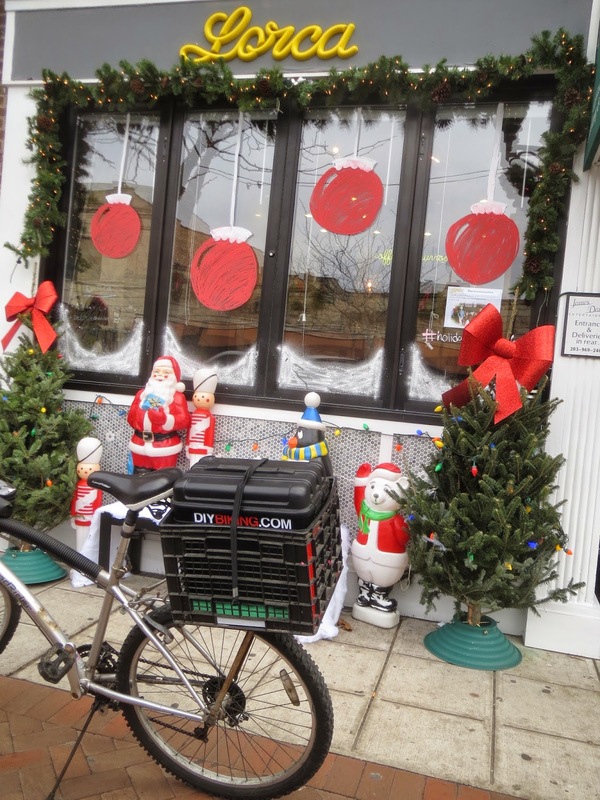 So if you’re in or near Stamford and want to buy a gift for that special cycling/coffee lover hybrid in your life, stop at Lorca at 125 Bedford Street in Stamford. The counter looks like this these days - but be assured this pile of goodies won’t block your view of the good looking staff. 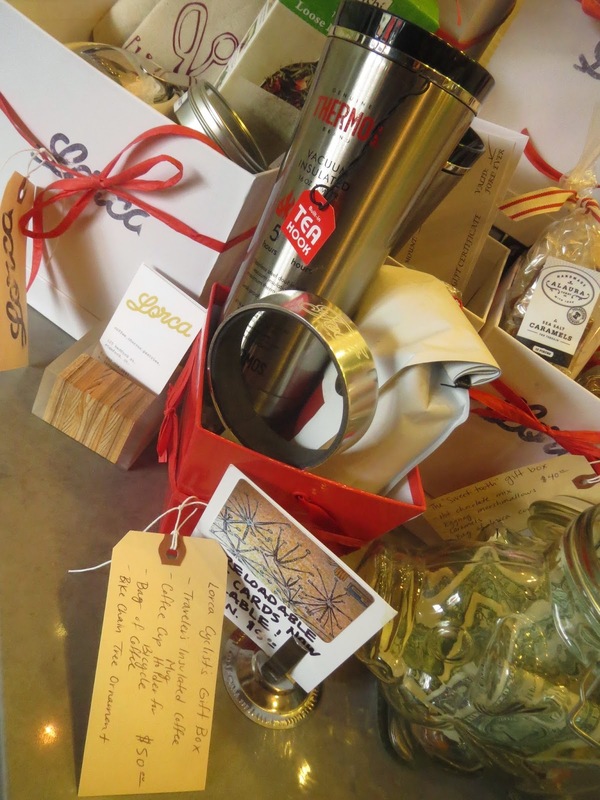 Lorca has actually assembled a variety of gift packages: There’s one just for people who like iced coffee, a ‘World Traveler’ gift set, a knitting club gift box, the tried-and-true Coffee Enthusiast Gift Box and others. But the one that caught my eye is The Cyclist Gift Box. Given my expertise in coffee spillage while bike riding (and my second-degree burns to prove it) I did not want to post about this gift idea until I had a chance to check out the lid with my own eyes. My photo of the lid didn’t come out well (it is actually a pic of a jet engine at Westchester Airport*) but be assured this lid was made with minimal spillage in mind and maximum reliability. In addition to the Traveler coffee mug, the $50.00 package also comes with a cup holder for handlebars, a bag of coffee and a tree ornament made from recycled bike chain links. So that’s the first gift on the DIYBIKING.COM #GiftsForCyclists’ special. Head into Lorca and pick one up today - and get a hot cup of caffeinated holiday cheer for yourself while you’re at it. Chain your bike to the parking meter. Thanks for reading and thanks for riding.